BLANCO is one of the leading providers of innovative, design-oriented system solutions for work stations in domestic kitchens and food service equipment. With the support of their business partners they, as providers of systems, develop and design attractive solutions for work places which make work in domestic kitchens, food service and in medical operational areas less onerous. They recognize, inspire and fulfill customer's desires. They evolve innovative, flexible solutions which are exemplary in design, function, quality and service. Available at AJ Madison. They use the expertise, commitment and creativity of their employees as well as advanced and environmentally-friendly technology in order to always stay one step ahead and to be the most attractive supplier in the world. They want to be a "5-star company" and inspire their customers. Functionality for the professional kitchen. 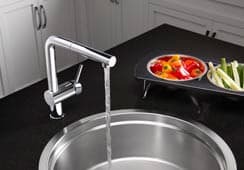 Designed with a high arc spout, which swivels 360 degrees to easily fill pots, pans and vases. Plus, it coordinates with SILGRANIT II sinks.